Two miles E.S.E of Logansport ’s 18th Street Bridge [over Wabash River ] & in a small woods in the S.W. 1/4 of the N.W. 1/4 of Section 4 of T26N; R2E & in N.E. WASHINGTON TOWNSHIP of S.E-Central CASS COUNTY, in north-central IN. Keith A. Gohl, of 406 Wheatland Ave. , Logansport , IN & member of the L’Anguille Valley Historical Association, in 1952 discovered deeply embedded in a small southern tributary of Minnow Creek [which latter stream rises near ANOKA JUNCTION & flows N.W. to join the Wabash south of KIENLYAS ISLAND ]. The large & ponderous lettered portion of an old tombstone which dates almost back to this regions earliest period of American Settlement; and which our association therefore has; with great difficulty, excavated, rolled over, examined, cleaned & deciphered each of its 8 sides as follows. This would indicate that John was b. ca the close of the war of 1812 or about Feb. 28, 1815; and that his widow Sarah was b. on or abt. 15 Nov. 1820. This huge 10-sided block of carved stone in the creek was abt. 150 ft. S. of the high-elevated double track of the PA. Railroad & due E. of the Logansport ’s “South Yard” [Yard A] & at the foot of the steep & abt. 4 ft. west slope of the old abandoned [rails & ties removed] former Union Traction Co., of Indiana ’s electric-interurban between Kokomo/Walton & Logansport. This interurban route ran from S-to-N down the center of a shallow valley or hollow so that it divided the valley into 2 hollows & each hollow contains a winding creek. The Two streams [just a stones throw from one another] require each to have its own separate & amazingly large underpass in crossing the elevated-track right of way [double track] of the PA railroad. The tunnel to the E. known as [194/16] was used by the interurban as well as the creek. 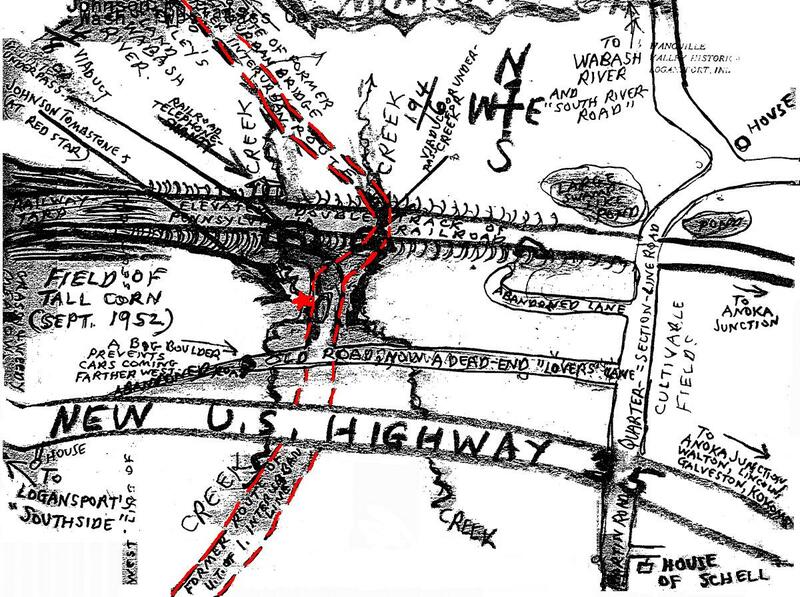 The tunnel to the W. known as 194/18 underpass was used by farm wagons & horses & contains an above ground 5-ft. metal sewer thru which passes the West flowing creek & this is the one which this document is concerned with as the monument is very close to the N.E. corner of Reserve No:5 which was granted by an Indian Treaty to Rebecca Hackley. In 1952 the abandoned interurban right-of-way is a gravel road which the railway employees would at times arrive at by taxi cab & then accessed it by climbing up hill to a shanty thru which came messages over a loud speaker via Logansport ’s railroad offices & the light pole conspicuously marked “1941”. This point is of some importance as it is between the busy switching-yards & [a little over a mile S.E. of ANOKA], an important junction where the 2 main lines of the Pennsylvania & the Cincinnati-Columbus, OH railroad lines unite before entering the yards in Logansport. Extensive research in the Cass County Courts failed to disclose traces of any pioneer settler or land-owner named “John Johnson” in this immediate area but does reveal an Israel Johnson a prominent pioneer-settler who may have been a close relative of John’s. Israel Johnson was born 1803 in southwestern, PA; Settled for a time in or near Richmond, IN before coming to Cass Co. bef.,1829; Entered farm or tracts of land in Section 9 of Washington Twp., per old manuscripts & patented in 1846 [abt. 9 yrs. before the death of John Johnson.] For information on Israel Johnson, see Helm’s “History of Cass Co., IN”, 1886 pg. 520. Although site-indications suggest that the stone may once have stood on the brink of the interurban right-of-way [rough ground & rusted fragments of a wire fence were noted there]: and may have been knocked down the west incline into the creek by a falling tree;[the decaying log of which added greatly to our difficulties in excavating the monument from the creek-bed]; the present writer doubts that so seemingly very old [and apparently very large tombstone would have been erected on what seems to be a man-made elevation of the present century,--unless the tombstone was deliberately move and re-erected there by interurban construction crews. The question therefore arises, “Might not this huge section of an old monument been transported to this area from some distant point; perhaps by interurban flat-car, gondola or even by a modern truck or wagon & dumped down the incline [with perhaps other rock or “fill”], for the purpose of erosion control of the former interurban roadbed? Investigation disclosed evidence that this has occurred at least once in this area decades ago on the orders of the late Charles Tabor who owned land in this woods & who also owned a lot on S. 6th St. [ Logansport ] was tenanted by a monument-dealer! If this is the correct explanation for the presence of this pioneer settlers monument at this location than the graves of the Johnsons might be elsewhere than in Washington Township . 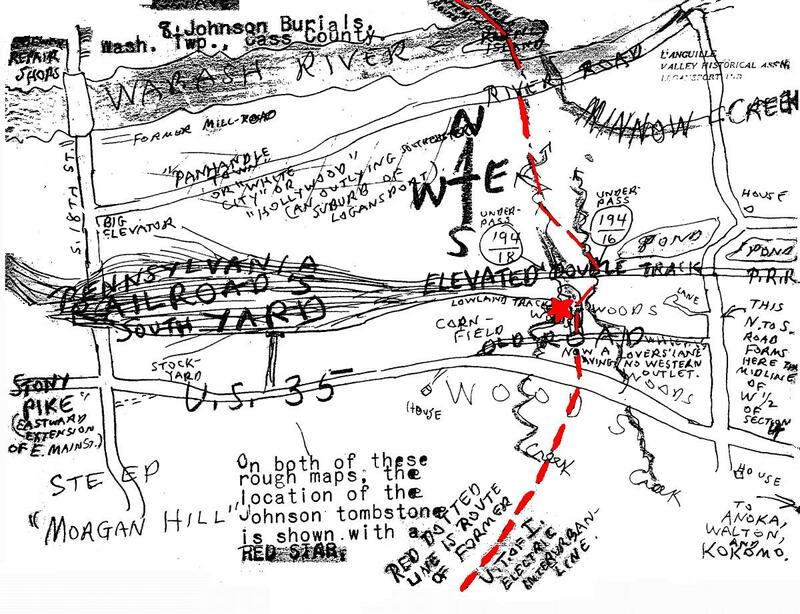 The location of the Johnson tombstone was very difficult to describe; due to several faulty & contradictory old maps, and to the confusion of the boundary-lines in this area [of numerous winding small creeks, irregular terrain, steam & electric railroad expansions & recessions; abandoned roads, radically re-routed highways [winding, angling, curved & irregular shaped farms & Indian reserves] which evidently were surveyed before the orthodox crisscrossing of the area with the congressional-township surveys were started and which do not conform at all to the letters, lines, boundaries & corners! 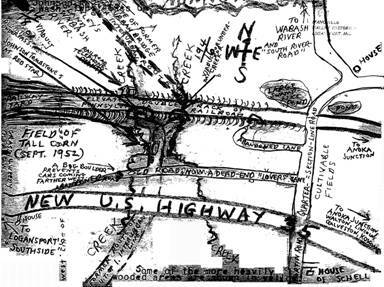 Even the 1939 Aerial photographs of the area are inadequate & misleading; for the radical re-routing of Hwy.35 [ Logansport-to-Walton ] [a re-routing not conforming entirely to its own original plans] has occurred since then. 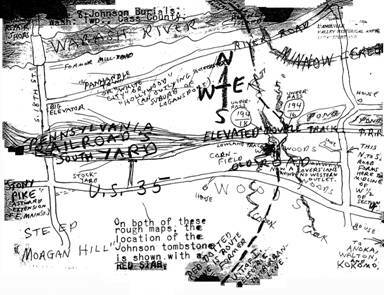 In an effort to enable strangers to the area to locate the Johnson tombstone; we here submit 2 rough maps. for the Indiana State Historical Association & Indiana State Library, Indianapolis , IN. With assistance by members of the L’Anguille [we say, LONG-EEL] Valley Historical Society members :Keith A. Gohl, Asher A. Wilson, R. I. Summrs, Roscoe Hawkins & E.R. Carter. Report was input by Pat Fiscel March 2007 for the Cass County INGenWeb Project.